The Logic addon for Quiz and Survey Master allows you to hide or show different questions based on what the user selects for other questions. You can set the addon to show a question when another question’s answer is equal to a certain answer or if it is not equal to a certain answer. You can also show or hide a question if the selected answer is greater than or less than a given value. Once you have purchased the addon, you will have access to download the addon. To install, simply upload the addon as a normal WordPress plugin. To do so, go to the Plugins page and click Add New. Then, click Upload. From there, upload the zip file that you downloaded when downloading the addon. Once the addon has uploaded, you should now have the plugin QSM - Logic listed in your list of plugins. Activate that plugin. 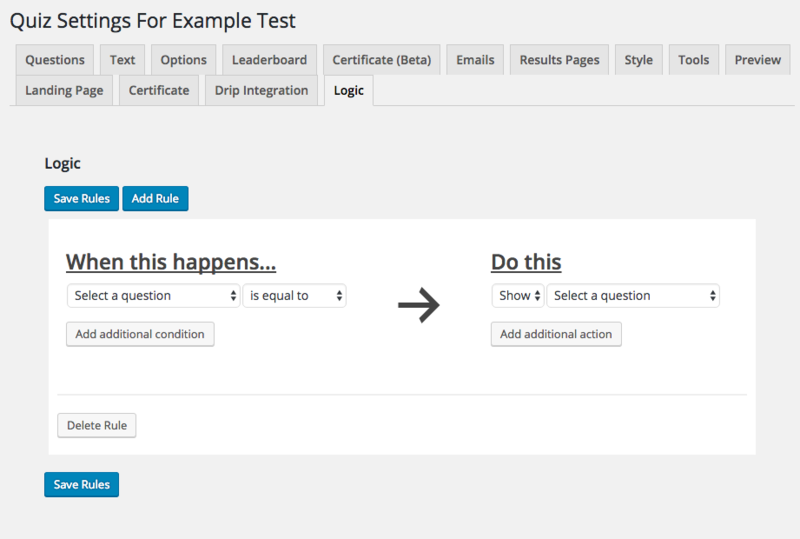 Once activated, the plugin will add an option in the Quizzes/Surveys list labeled Logic. In the new Logic tab, you will see the Logic page. This page will list to options, to 'Add Rule' and to 'Save Rule'. To get started, click on the 'Add Rule'. First, underneath the label 'When This Happens', select a question that you have in your question bank. You will then have the following options of 'is equal to', 'is not equal to', 'is greater than', 'is less than'. The next box will be the answers that are listed in the question that you have chosen. 'is equal to' is used when the test taker selects the answer specified. 'is not equal to' is used when the test taker does not select the answer specified. 'is greater than' is used if the answer contains numbers and the rule will perform the action specified if the answer is greater than the answer specified. 'is less than' is used if the answer contains numbers and the rule will perform the action specified if the answer is less than the answer specified. Once you select all of your options under the 'When This Happens' section, it is time to move onto the 'Do This' section. In this section, you can choose to either 'show' or 'hide' any one of the other questions listed in your test bank. Once it is set up, make sure to click the 'Save Rules' button beneath the rule. You also have the option of creating additional conditions to go with a rule and also additional actions. This will add specific and limiting conditions to the rule that you have already created and additional rules as well that will only affect the questions you have selected in the rule. If you would like to create a rule for multiple questions or for all of your questions, click the 'Add Rule' button on the top of the Logic page. This addon can customize your quiz in a vast array of different ways! If you have any trouble implementing the logic rules or have more questions about the process, please fill out a support ticket by going to the WordPress dashboard and selecting ‘Help’ in the QSM plugin and our Support Guru will be able to help you.